This patient had an apicoectomy on #4. 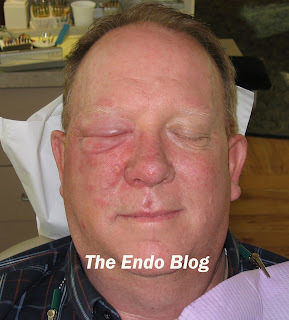 Six days later while traveling out of town, he began to have severe pain and lesions form on his face. He came to our office for evaluation of the surgical area. As you can see, he experienced the classic outbreak of herpes zoster (shingles). For a brief review, after initial infection with the VZV (chickenpox), the virus goes into a dormant state in the dorsal spinal ganglia. The re-activation of this virus causes herpes zoster. The reactivated virus will become apparent in the distribution of the affected sensory nerve. Zoster occurs in 10-20% of individuals, and increases with age. As opposed to the herpes simplex virus (HSV), single recurrences are generally the rule. Predisposing factors for reactivation of the virus include, immunosuppresion, treatement with cytotoxic drugs, radiation, malignancy, age, alcohol abuse & dental manipulation. Clinical features begin with pain in the epithelium of the affected sensory nerve (dermatome). Typically one dermatome is affected. Prodromal pain often accompanied by fever, malaise and headache is usually present for 1 to 4 days before the outbreak of the cutaneous or oral lesions. 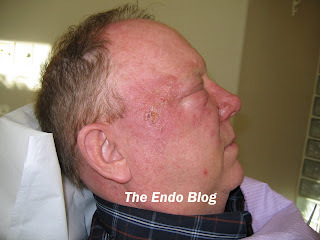 Involved skin will exhibit a cluster of vesicles on an erythematous base. 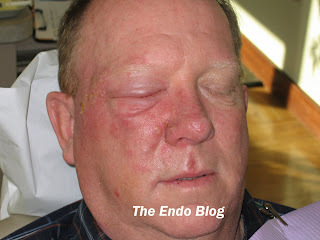 After 3 to 4 days, the vesicles become pustular & ulcerate. Crusting develops after 7 to 10 days. The exanthem usually resolves within 2 to 3 weeks. Scarring can occur. Pain lasting longer than 1 month following a shingles outbreak is known as postherpetic neuralgia. Most of these will resolve within a year. Treatment for herpes zoster is mostly supportive and symptomatic. Fever should be treated with antipyretics without aspirin. Lesions should be kept dry and clean to prevent secondary infection. Topical or systemic antipruritics can be given to decrease itching. Corticosteriods have been used to minimize associated neuralgia. High dose acyclovir can decrease duration of the exanthem and severity of pain. In this case, special consideration was given to the involvement of the eye. Proper referral to medical and dental specialists is important to prevent permanant damage to affected areas such as the eye. 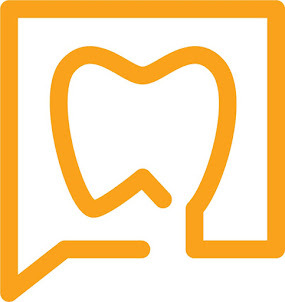 Photographs used with patient's written permission. From what I understand, there are some who think that aspirin will exascerbate the viral outbreak. One of the classic signs Jason, is the lesions to exactly the midline of the palate. Sometimes, when the outbreaks are early, you're not sure if it's a bacterial cellulitis then you look at the palate and bingo -- the lesions stop dead in the middle. Great case (poor guy). Ian. Herpes Zoster Shingles is most commonly known as simply shingles. It is skin disease which is cussed by a virus named as Herpes virus. This is the same virus that causes chickenpox too. Shingles is a common term used by most of the people. In scientific terms, the name of this disease is Herpes Zoster.